Do you have songs on your iPhone Music app that are greyed out and when you attempt to play them on your iPhone you get the item not available message? Further, the greyed out songs appear on your iPhone even though they do not show up in iTunes when you connect your iPhone. In some cases, new songs you copy to your iPhone do not play or you can not go back to a previous song (sometimes a greyed out song quickly shows up on screen before playing another song). 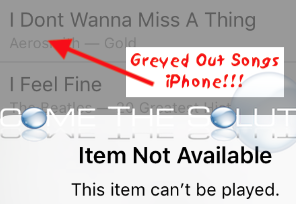 There is a simple fix to remove all the greyed out songs on your iPhone and copy new music correctly again. You should get familiar with the steps below until Apple is able to fix this issue in an iTunes / iOS update. Plug your iPhone into your computer you sync with iTunes. Click the iPhone icon in the iTunes bar to go to your device pictured below. Click on Music under On My Device. Now, drag in a few new music files you want to copy to your iPhone. 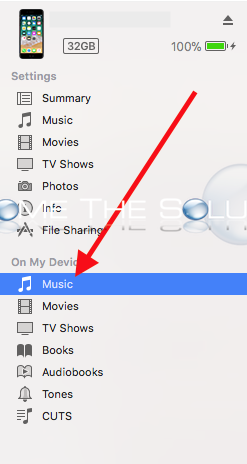 As soon as you are done copying, click Sync and then Done in the bottom right corner of iTunes. Immediately, the greyed out songs on your iPhone will all disappear and you can continue copying new songs to your iPhone again and listen to them without interruption!